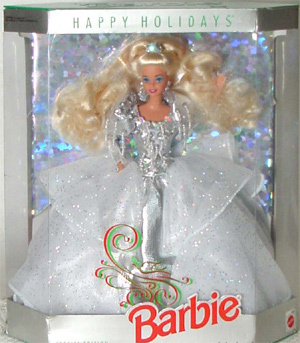 1992 Happy Holiday Barbie was the 5th holiday Barbie. 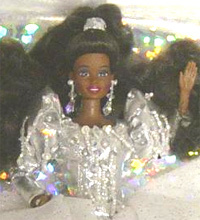 She is wearing a glamorous silver lame gown with a full skirt and dropped waist. The skirt has an overskirt consisting of many layers of sparkling tulle. Strands of silver beads drop from the silver lame bodice. 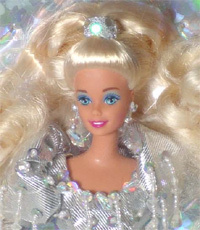 She has silver earrings and a silver jewel hair ornament holds back her long blonde hair. 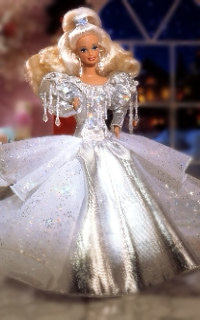 The 1992 Holiday Barbie Ornament was done as a 2000 Hallmark Collector's Club exclusive.